Registration for Spring League (games) is currently on a waitlist. Please submit registration if you wish to be added to the list. Spots still available for Spring Development. 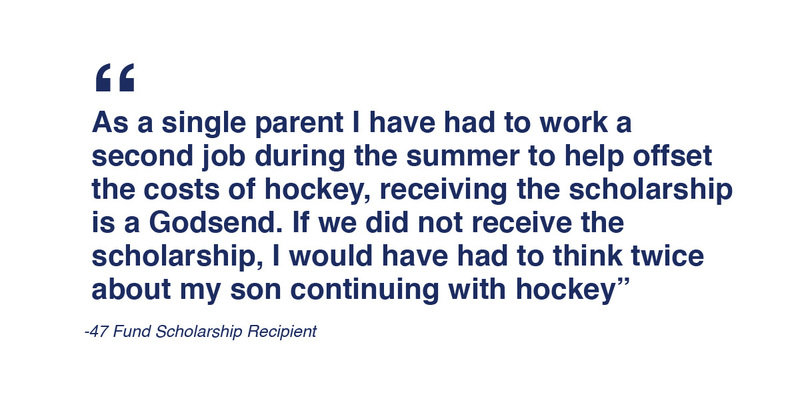 The Scholarship Program that Gives Back to the Hockey Community! The 47 Fund was established in 2012 as a scholarship fund for the St. Louis Rockets in memory of Art Martin (1947-2012). Art was an active member of the Rockets board of directors and volunteered many hours to the organization. Art played ice hockey for years and passed his love of the game to his sons, who both played in the Rockets organization. Art was an inspiration to everyone that encountered him and touched many lives. Our mission is to continue Art's memory by providing scholarships to youth hockey players. The 47 Fund is exclusively funded by individual and corporate donations. These donors share in our belief that ice hockey provides an unparalleled opportunity for children to develop a strong body, mind, and character. All scholarships are awarded inside of the St. Louis Rockets Hockey programs to deserving youth participants. The recipient receives scholarship money that is applied directly to offset the cost of their annual fees. The number of applicants has increased over the years. We have gone from awarding one scholarship six years ago to twelve this year. The 47 Fund is under the Rockets 501c3 youth hockey organization. The St. Louis Rockets Hockey Association is a non-profit 501(c)3 organization. We are a fully-sanctioned member of USA Hockey, and we rely on the collaborative efforts of many people who volunteer their efforts in providing a forum for youth ice hockey. While our players have a wide range of skill levels, they are all committed to the sport and display an intense desire to improve as athletes and individuals. Our programs stress sportsmanship, friendship, goodwill, and strong values. Our players go on to play high school hockey, win state championships and earn collegiate scholarship opportunities, but all of our players take away lifetime skills, team concepts and relationships that will benefit them both on and off the ice. ©2019 St. Louis Rockets Youth Hockey Club / SportsEngine. All Rights Reserved.